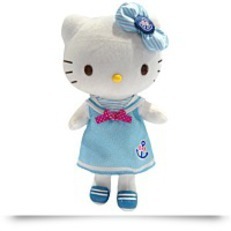 The child will relish this Fashion Sailor Plush - a great Hello Kitty doll by Hello Kitty. The UPC barcode for this is 039897499840. A listing of special features include comes with removable fashions shoes and this hello kitty push stands 11" high. It's dimensions are 12" Height x 5" Length x 8" Width. 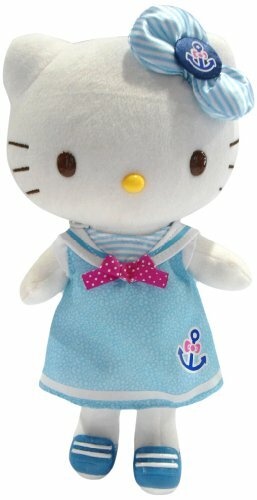 Buying the Fashion Sailor Plush . For more information about this doll, click on the shopping cart add to shopping cart button on this site. This Hello Kitty Push stands 11"high and comes with removable fashions and shoes. Every girl will wish to dress up their Hello Kitty and express their personal personal style. Additional fashions sold separately. Available in 3 styles. Dimensions: Height: 12" Length: 5" Width: 8"
Package Dim. : Height: 4.6" Length: 12.1" Width: 8.4"